WikiLeaks founder Julian Assange was arrested in London and is now facing charges in the U.S.
At a time when everyone should be out in the streets shaking the earth and protesting the Trump administration's prosecution of Julian Assange for exposing US war crimes, those who continue to support this president have one message and one message only when it comes to the WikiLeaks founder: Don't do anything. Relax, wait and see, trust Trump, and don't do anything. Trump is about to save Assange, and save us all. Do nothing. To be clear, not everyone who voted for Trump is doing this; many are aggressively opposing this administration's prosecution of Assange and vocally withdrawing all support for him. But the ones who are engaged in the behavior I'm describing are all helping to kill the loud and aggressive opposition to Assange's imprisonment, which is so desperately needed right now, and they're helping everyone they claim to oppose. The pussyhat-wearing Assange haters and the MAGA hat-wearing Assange lovers are on the same side on this issue, mindlessly working toward the exact same agenda: the permanent imprisonment of a truth-telling journalist. Every time President Trump advances a longstanding evil agenda of America's permanent government, I see my social media notifications swarmed with Trump supporters telling me that it is actually a good thing, because it's secretly a brilliant strategic chess move that the 45th president is taking against the deep state. When I say that this happens every time, I'm not being hyperbolic to make a point. I mean it happens every single time, without a single, solitary exception, always. It happens with such clockwork reliability that I preemptively addressed it in the article I wrote when Julian Assange was arrested, saying, "I am going to have a zero tolerance policy for QAnon cultists who try to tell me that this is actually 5-D chess by Trump to overthrow the Deep State. Stay out of my comments, stay out of my social media notifications, stay the hell away from me, and please rethink your worldview." I said this because I knew it was coming, and indeed it did. All sorts of theories have been concocted since Assange's arrest which people cite as proof that Trump is actually protecting Assange with his administration's indictment and extradition request, instead of working to imprison a journalist for exposing US war crimes, which is actually what's happening. They tell me that Trump is bringing Assange to America for trial because he can only pardon him after he's been convicted. This is false. A US president can pardon anyone at any time of any crime against the United States, without their having been convicted and without their even having been charged. After leaving office Richard Nixon was issued a full presidential pardon by Gerald Ford for "all offenses against the United States which he, Richard Nixon, has committed or may have committed or taken part in during the period from January 20, 1969 through August 9,1974." Nixon had never been charged with anything. If Trump were going to pardon Assange he could have done it at any time since taking office, instead of issuing a warrant for his arrest in December 2017 and executing it on Thursday after a series of international legal manipulations. A pardon is not in the plans. 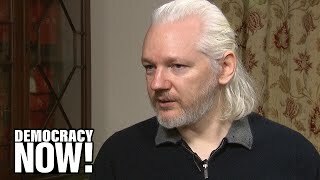 Another common belief I keep encountering is that Trump is bringing Assange to America to get him to testify about his source for the 2016 Democratic Party emails in exchange for a pardon, thereby revealing the truth about Russia-gate's origins and bringing down Clinton and Obama. This is false. Everyone who knows anything about Assange (including the Trump administration) knows that he will never, ever reveal a source under any circumstances whatsoever. It would be a cardinal journalistic sin, a violation of every promise WikiLeaks has ever made, and a betrayal of his entire life's work. More importantly, imprisoning a journalist and threatening him with a heavy sentence to coerce him into giving up information against his will is evil. If you believe your president is doing that, the last thing you should be doing is cheering for him. But that isn't what Trump is doing. Trump is pursuing the imprisonment of a journalist for exposing US war crimes, so that he can scare off future leak publishers and set a legal precedent for their prosecution. I've been engaging people in debates on this subject online so I can understand their arguments well enough to address them, and what I've learned is that they don't really have any. Those who believe Trump is actually secretly helping Assange and helping the American people by prosecuting a journalist have no basis for their belief other than pure faith that Trump is good, therefore anything he does must be good. It's the exact mirror image of Russia-gate hysterics, and it benefits the exact same corrupt establishment. The mental contortions that people are doing to avoid the cognitive dissonance between their support for Assange and their support for Trump is truly something to behold. For the last 24 hours QAnon adherents have been telling me that Assange holding a Gore Vidal book when arrested is an undeniable signal that he's in coordination with the Trump campaign to bring down the Deep State, and that I'm crazy for being unable to see that. Turns out it was actually a book that Assange wanted to read while he was waiting to be processed at the courthouse, which makes sense since Vidal's "History of the National Security State" covers a subject that Assange has devoted his entire life to. QAnon is such a brilliant propaganda construct. With some cryptic posts on an anonymous message board, whoever is behind that psyop has succeeded in manipulating a vocal and impassioned sector of Trump's base into applauding every single step he's taken in advancing the dystopian agendas of his predecessors as a brilliant 4-D chess move against the establishment. I've been told that his bombing of Syria actually took out an Iranian nuclear base, that he's helping to free the Venezuelan people without harming anyone, that he's fighting the deep state in Iran, that his dangerous escalations against Russia are just a show because he and Putin are working together (a comical overlap with the Russia-gate crowd), and last year they were telling me that Assange isn't in the embassy at all because Trump had already covertly rescued and pardoned him. There are people who honestly believe that there is a revolution against the establishment underway which is being led by a plucky alliance between the President of the United States, the Prime Minister of Israel, and the Crown Prince of Saudi Arabia. It's that bad. The persecution of whistle blowers is the only thing that NObama did that trump is continuing 100%. NObama jailed more whistle blowers than any POTUS so trump has to 'do better' than him. Trump is a demagogue and his supporters who will bend over backwards to justify anything he says or does are brainwashed. He is not acting in their interest or anyone else's except his. The underside of the Trump bus is full. And he can barely string together a sentence or play checkers, let alone multidimensional chess.